When I decided to add recommended reading to this blog, I naturally assumed the books I’d recommend would be serious reads. Who knows why I thought that. Certainly no one really cares. This book, however, is definitely Eternal Scheme genre. I was scouring the library for enough books to hold me over for the Labor Day weekend. I was excited to find a couple of new books that might fit the just-entertain-me bill. 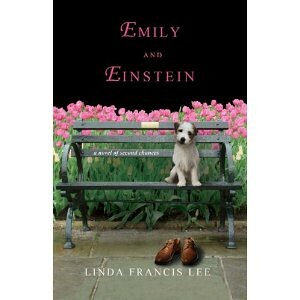 Friday night I settled in with Emily and Einstein. What a delightful surprise! Not only was this book enjoyable, there was an underlying message of hope and redemption…definitely eternal scheme material! The story catches you right from the beginning. You’re drawn into a tragedy that could happen to any of us. Then, as if the tragedy itself isn’t enough, Emily is forced to face an ugly reality about her husband. Of course, those kinds of realities are also about ourselves, so Emily has to dig deep herself. Linda Francis Lee mixes the perfect amount of intensity and humor to keep us completely engaged into story. Her dead-husband-embodied-in-a-dog’s-body, also has a chance to redeem himself. Lee does a superb job of taking the histories of each of the characters, keeping them real, letting us peek into their choices, revealing that there is hope and redemption for all of us who are willing.